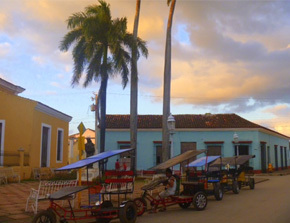 Staying in a casa particular will give you a real taste of Cuba. The hospitality in Cuba is astounding and staying with a family in a casa particular is an experience not to be missed. You will be welcomed with open arms and made to feel like part of the family from the moment you arrive. Cuba is about the people you meet and the experiences you share. Taking part in one of our cultural programs will open a door into a whole new world, bring you into contact with local Cubans and ignite long lasting friendships. Cuban Percussion workshop in Trinidad ------------------------- #5 (out of 5) --------------------- April 2018 ------------------------------------- How was your experience? #5 Excellent -------------------- What did you like? ------------------ Our instructor David! A real professional musician and teacher. He had a great sense of humour and was diligent in making sure we understood the lesson and we played the instruments with some success and correct rhythm. tons of fun even though I was tense trying to learn. 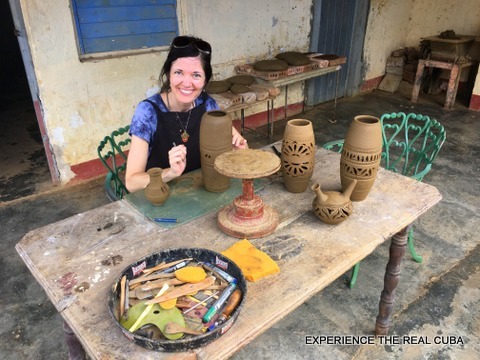 Ceramics Lessons in Trinidad #5 (out of 5) January 2018 ------------------------------------ The program is by far the best program I have done out of all my travels! ----------------- I liked - When I was planning my visit to Cuba in Jan 2018 I was looking for a truly unique experience, something beyond just taking a car tour or visiting a museum. This program offered exactly that. I believe they offer Spanish classes and an array of art classes. All of which I felt would truly provide me a chance to learn something about Cuba that I couldn't learn from a book, resort, museum etc. I opted for the ceramics class since I never did it before. My teacher was excellent! A really cool guy that is just a badass at this ancient art form. I highly recommend Experience the Real Cuba to anyone that is interested in going to Cuba. You won't regret it! The Ceramics Workshop in Trinidad organised by Rena was amazing. I had prior experience of ceramics but I was able to learn the traditional practices of the family. My teacher and his family were super cool, it was an amazing experience! 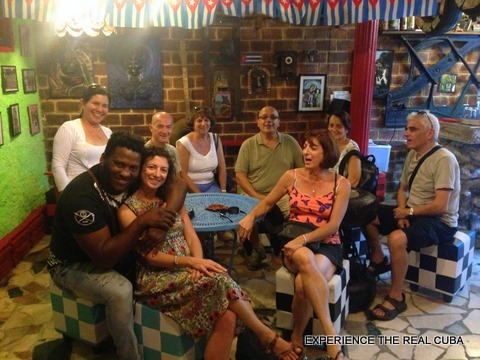 I had a FANTASTIC experience with Experience The Real Cuba. Rena, helped me organize 14 nights of accomodation, in both Havana and Trinidad. I can easily say, she was one of the best trip planners I have ever dealt with. I am an extremely independent traveler, who had a million questions before the trip. Rena, calmly answered all of them. With the current situation in Cuba, you need someone like her in your corner, organizing transport and accomodation in advance. All of the casa’s under her watch are really good, and I had nothing but positive experiences in both Trinidad and Havana. Furthemore, her arrangement for Spanish lessons with Juani in Trinidad was spectacular. Juani, taught me so much more than just Spanish grammar, but about the Cuban experience. I would recommend any of my friends to reach out to Rena to help set up their stay in Trinidad or Havana. Her connections will make your trip that much better!! And she’s a wonderful person as well, who went the extra mile when we were in Trinidad at the same time to make sure I was having a positive experience. Community Projects Tour #5 (out of 5) ----- Yummet was an excellent guide. It was nice to see how people are trying to create enterprises to help elevate their professions and incomes. I especially liked visiting the different areas and speaking to the entrepreneurs. My husband and I wanted to travel independently to Cuba on an educational visit. 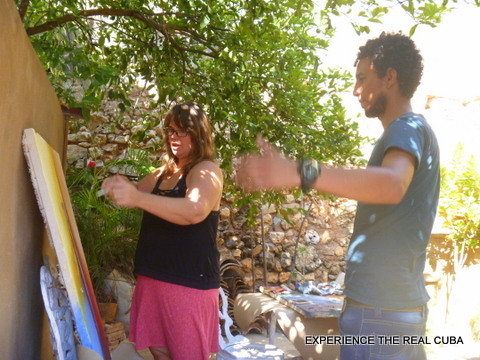 We wanted to experience the ‘real’ Cuba and interact with the people one on one. We were looking for classes we could take that would allow us such an opportunity and came across this website. 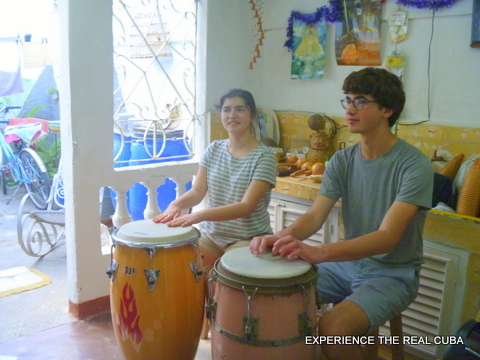 Prior to our arrival in Trinidad, we arranged a Spanish, percussion, and ceramics class through Rena. These classes were some of the highlights of our trip! They exceeded our expectations. Our Spanish and percussion lessons were given in the teacher’s home. What a great insight into the life of a local. Not only did we learn a lot in our classes, but we made great friends. I can’t imagine a better way to get to know the people of Cuba than through these classes. We also met Rena while staying in Trinidad. She is one of the sweetest people you’ll meet and was very helpful in answering our questions and providing recommendations. I hope someday our paths will cross again. I would highly recommend booking through Rena. My two teenage children and I travelled to Cuba just after Christmas 2016 for 10 days. 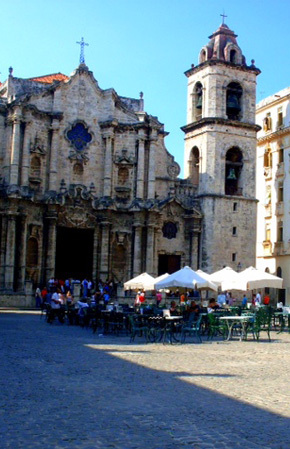 Rena organized casas in Havana and Vinales, Spanish lessons, walking tour and a salsa lesson. The Casas were clean, the casa food safe and plentiful, the tours and lessons timely and worthwhile. The salsa lesson in Havana with Yoanka was superb. Rena answered all my questions quickly and confirmed our booking in very short order. We found Cuba to be very busy at the time we travelled so having the accommodations secured before we went saved a lot of stress and uncertainty. We choose to use the Vinales bus system and it was fine, but we found the system very busy and seats sold out quickly. I would now consider taking a taxi organized by Rena especially if there are a number of people in your party. Even if you are a seasoned traveller Rena’s service does not diminish in anyway your independence. The Cuban’s she connects you with are genuine, intelligent and most thankfully not trying to sell you something you do not want. One heads up one Cuban dollar cost me $1.40 Canadian. I naively thought it would be closer to the exchange rate (buying rate) of Canadian to American of $1.33. My partner, Austin, and I traveled to Habana, Trinidad and Varadero for seven (7) days in June 2016! We were very excited to travel to Cuba but we weren’t sure where to start or how to get there or how to plan the trip once we got there…From the moment we arrived in Habana, Rena planned our travel, stays at casas and tours. Rena helped us balance tours and being able to explore on our own! We had such an amazing trip! Before we left, we looked up every blog, read every book and talked to so many people that had either been there or wanted to go there. We were definitely overwhelmed with information and didn’t know how to begin planning the trip especially since we were coming from the United States and wanted to travel independently from a “tour group”. I came across the Experience the Real Cuba website and emailed Rena. Within a day, she had responded and jumped at the chance to help with our trip to Cuba. Rena helped answer EVERY question I had and made sure that she knew the style of travel that Austin and I wanted to experience. We were looking to explore Cuba at a very raw level: wanting to understand the history, see amazing sights, meet the people and live and breathe the culture. Rena helped us do that and much more!! One of our favorite parts of the trip was Trinidad. We met Rena in Trinidad and she gave us great recommendations on places to eat and go out. We were able to take an intimate tour of the city with a private tour guide – he was so knowledgeable about the history, the community and how important the city is to the development of Cuba. He pointed out museums, sights, bars and other areas that we ended up visiting after the tour. It was great to get an in-depth “lay of the land” from someone who was born and raised in Cuba! That same day, Rena had booked us for a salsa lesson. 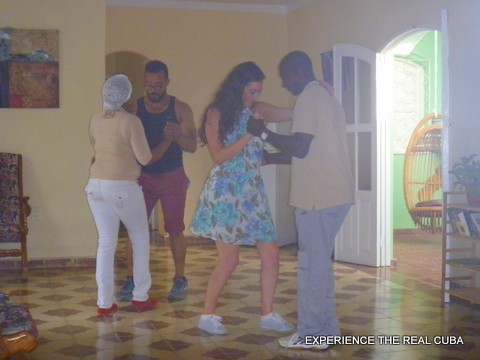 We had the BEST time with the instructors, and learned REAL CUBAN SALSA! We now practice back home because the lesson inspired us! Overall, I would highly recommend Experience the Real Cuba and Rena to help you with your travel to Cuba! We fell in love with Cuba and the cities we traveled too. 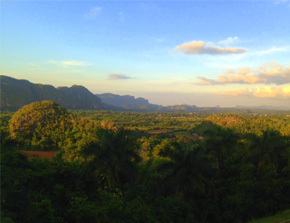 Because of Rena’s help, we felt safe, smoothly traveled from one city to the next, and experience the real Cuba! We worked with Rena to arrange percussion lessons for our 12 year old son. He took lessons in Havana, with Octavio, and in Trinidad, with David. These experiences were the highlight of our two week trip to Cuba – without a doubt. Both Octavio and David were fantastic teachers, incredible musicians, and wonderful human beings. Our son learned a tremendous amount and really had fun. We were all very comfortable sitting in their homes while he took his lesson, or leaving him alone while we explored. I can’t say enough about Octavio and David – they were incredible people and learning with them far exceeded our expectations. If you have an interest in percussion, if you have a child with an interest in percussion, it’s worth making the trip to Cuba just to meet them. Rena helped me to plan and organise a three week trip back to Cuba (Feb/Mar 2016) after my first visit two years ago where I travelled in a group. Coming back independently was a little daunting so having her and her team help me with accommodation, transfers, and Spanish and salsa lessons was fantastic. The entire time from planning to during my trip, communication was quick and helpful, nothing was a problem even tweaking my itinerary mid-trip. The Spanish and salsa lessons in Trinidad were brilliant. Juani and Leosmel were perfect teachers, I would highly recommend spending some time in their company (and I say this despite not being a salsa natural!). All the casas I stayed in throughout my trip were great with very friendly and helpful hosts. Big shout out to Misleydis & Gustavo and Yaili & Oreluis in Trinidad who hosted me there (I still can’t work out where my favourite dinner was – they were all delicious!). Thank you for helping me have a fantastic trip! My 21 year old daughter and I stayed in Trinidad for 4 weeks with Misleydis and Gustavo and family in December 2015. Rena organised our stay and answered all my questions before we got there. We both LOVED it and ended up staying longer than planned as we really got to know Trinidad and the local neighbourhood. We didn’t want to leave…. ‘Our family’ were very helpful, friendly and caring and looked after both Mama and daughter very well. The meal in the morning and evening were delicious and we always looked forward to them especially the seafood. We also had some nice evenings with their extended family too playing dominoes and drinking La Canchanchera!! which we have made back here in Australia.. Maya enjoyed her salsa dancing with Leosmeil and had quite a few late nights dancing up at the Casa de la Musica and the discos with young people she met in Trinidad.. I also really liked my drumming with David, something I have never done before so that was great! Our Spanish improve slowly with the help of our vey patient teachers and family too but we know we have lots more to learn! So don’t be surprised if you don’t see us back in Trinidad again one day….Viva Cuba! Rena is a fabulous resource for anyone interested in having an immersive and authentic travel experience to Cuba! We were a group of three seasoned travelers, having traveled to lots of places without a guide and just using Airbnb and other resources. However, we were nervous about going to Cuba without much planning or guidance, and didn’t want to miss the opportunity to learn as much as possible about the country and meet Cuban people. Rena really helped in both of these regards. She answered our myriad questions with patience and generosity, and matched a trip to our expressed interests and budgets. We ended up spending a week in Havana followed by a week in Trinidad, and were able to take spanish and dance lessons, and feel like we got to know the Cuban culture. 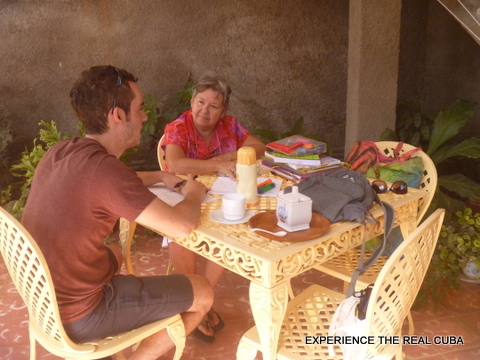 Rena has very strong relationships with the Cuban folks who will be your teachers, casa particular hosts, and trip organizers, which ensures that everything is well-communicated and goes smoothly. She loves Cuba and strives to show travelers an experience that makes them love it, too. We had a smooth trip and many amazing memories, thanks in large part to Rena. I had a fabulous stay in Trinidad, all arranged by Rena. She arranged for my friend and I to stay in two rooms at the home of Misleydis and Gustavo, and also arranged for a shared cab to bring us there from Havana. The casa is lovely, with a wonderful backyard where Misleydis and Gustavo served us a delicious breakfast every morning. Misleydis speaks perfect English and Gustavo and I communicated with my limited Spanish. We enjoyed sitting on their balcony every evening in the warm breeze. Misleydis also helped us make all our arrangement while in the beautiful Trinidad…..She found a driver to take us to Santa Clara for the day and told him to stop at some interesting sites on our trip through the mountains along the way. She also arranged a cab to take us to the beach for the day, and told us about restaurants and good places to hear music in the Trinidad town square in the evenings… She also spent time calling hotels in Havana for us, and when it turned out that they were all booked up, she found us a very lovely casa to stay at in Havana when we returned. We were very grateful. Rena offered to find us dance classes while in Trinidad and to help with any other questions we had. 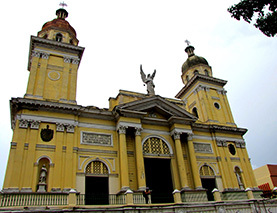 She provides a wonderful service that allows you to meet the people and get a feel for the real Cuba. She also checks in to see if all is going smoothly. I can’t wait to go back! I just returned from Cuba where I spent more than 2 weeks visiting a few cities (mostly Habana and Trinidad) and taking Spanish classes. Rena has been fantastic in assisting me throughout the trip planning and organisation, answering any sort of question I had and providing loads of useful information. The families she got me to stay with were lovely, extremely hospitable and helpful and they’ve always made me feel part of the family. My local Spanish teacher was also great, easily adjusting the classes to my interests and preferences. I’d recommend “Experience the real Cuba” to anyone who’s interested in travelling to the country and getting to know it from the inside. I went to Cuba for a month and had an amazing time. The family were really nice and were always willing to go out of their way to help me. I found all of Rena’s information and guidance really useful and it helped me a lot. 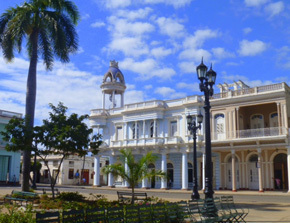 Trinidad is a great town with lots to do. I had a great time and would recommend it to anyone who wants to learn Spanish. I had amazing holiday in Cuba and big thanks from that goes to Rena and her great contacts all over the beautiful country! I contacted Rena in a hurry just a few days before our trip as some other arrangements had fallen apart. She replied immediately even if it was Saturday evening! Her advise was very helpful and she was quick to make all bookings as soon as we had made up our minds. 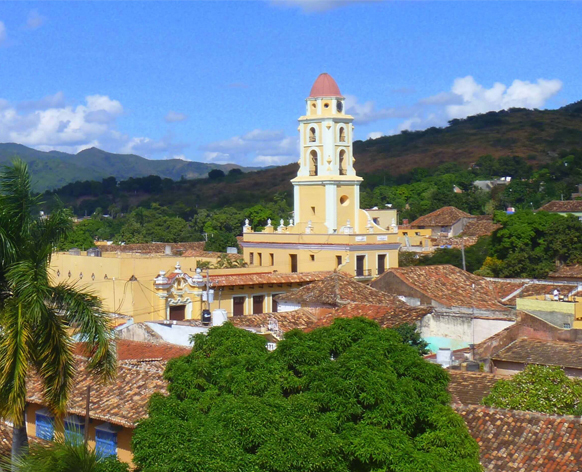 Rena booked us to casa particular both in Havanna and Trinidad and with the kind advise of Misleydis, we again found nice casas in Santiago de Cuba and Santa Lucia. Salsa classes made my trip perfect! Thank you for arranging the classes in Trinidad and finding a good place to dance with SalsAmiga in Havana. I had great time and learned a lot! All the additional advise was highly appreciated; advise on nice cafe’s, clubs and restaurants, what to do and what not to do, how much to pay for taxi etc etc. All communication with Rena was prompt, clear and helpful. Many people were wondering, when me and my friend went to Cuba on our own, without a package tour. Now I am telling everyone to Experience the real Cuba!!! I was taken extremely good care of! As soon as I had arrived in our casa in Havana, I got a friendly welcome call from Ernesto, who later picked me up with Yoanka to take a look at the salsa school, which was just two blocks away. From there on, everything was flexibly arranged according to my wishes and schedules. When arriving in Trinidad, we got a little lost. Immediately Gustavo jumped on his bike and came to pick us up! Wow! House of Misleydis and Gustavo was lovely and so were the hosts! Not to forget the salsa classes! and btw, there is excellent diving center at the near by beach, so it was a good combo. I really wish I would have had longer time in Trinidad. 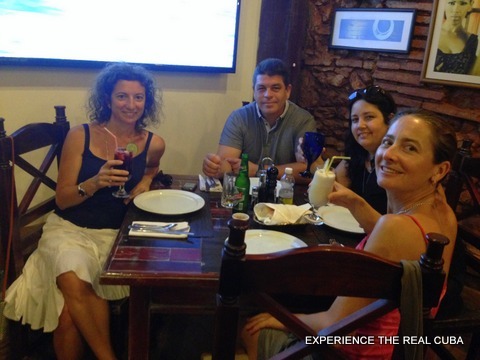 Thank you Rena, Misleydis & Experience the Real Cuba for everything! I am dreaming of returning back to the beautiful Cuba! From the moment we got off the bus from Havana on our first day in Trinidad and Gustavo was there with a big piece of cardboard with “KATIE” painted across the front, smiling and waving – we were in the clouds. Wisked onto a bicitaxi, we travelled in style, we drank sugar cane juice from the street stall and our ‘carriage’ dropped us right at the door of our wonderful new home and Misleydis was there to welcome us in. We felt so lucky to be living with Misleydis and Gustavo; the room and roof terrace were lovely, they really looked after us – helping us to organise outings and get settled in Trinidad, the food was fantastic and their company was even better! Juani is a wonderful teacher – I don’t think I could have survived 3 hours of spanish a day with anyone else, despite the beautiful setting and the lessons on the cool terrace. When we looked like we were loosing concentration she would shout “sube y baja!” and we would run up and down the stairs to the roof terrace, or she would tell us to dance. When we told her of our problems keeping our pasos cortos in salsa she told us that we should be able to salsa on a single floor tile or on a book – she proceeded to demonstrate by dancing on her grammar book! She was patient but also liked to push us so we always felt like we were making progress, even if it was slow. At home in the casa, eveyone would try to help us to speak spanish even if this had to dissemble into spanglish. Dancing was the highlight of our day! We had decided 1 hour wasn’t going to be enough before we even started and that was a great decision! – two hours a day for 2 and a half weeks and we were excited about every lesson. One to one dance lessons are something pretty special and Yailie and Yodani were great fun and brilliant dance teachers. Trinidad is a wonderful place and I feel very lucky to have been there. For anyone reading this who is on the fence – get yourself to Trinidad! Rena, once again thank you ever so much for all your help advice and support – thank you for introducing us to such a wonderful family!